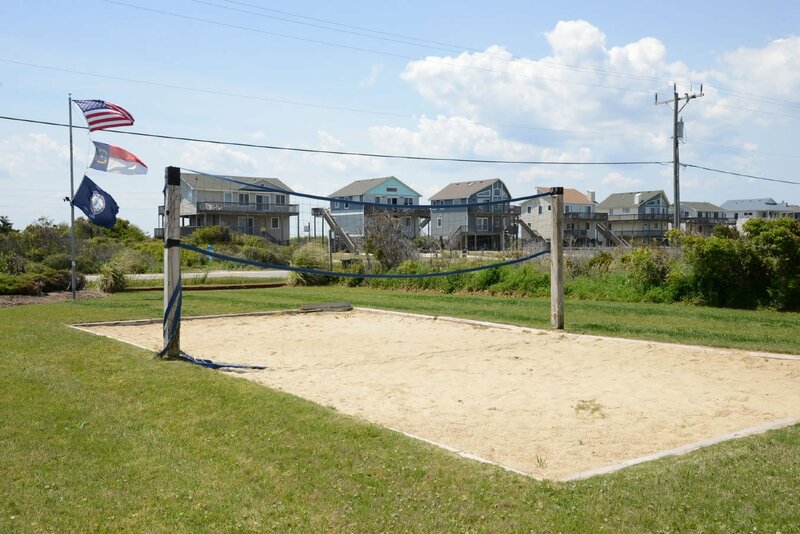 Address: 9619 S. Old Oregon Inlet Rd. 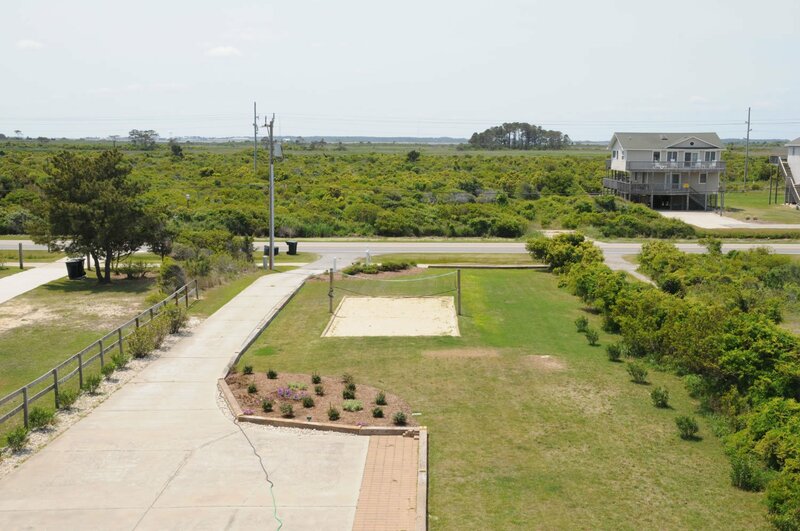 This Outstanding Oceanfront Estate is Spacious & Loaded w/ All the Extras that Ensure a Grand Outer Banks Vacation Experience. 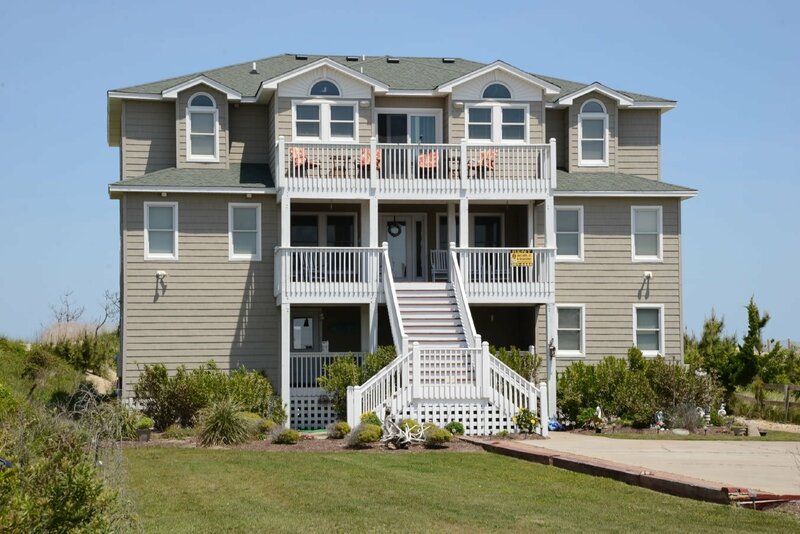 Located in the Quiet, Peaceful Atmosphere of South Nags Head, this Wonderful Home is Beautifully Decorated, Very Well Equipped, & the Glass Lined Oceanfront Living Area provides Magnificent Ocean Views! Perfect for Multi-Family Vacations & Family Reunions, there is more than Ample Space to make Everyone Feel Comfortable & at Home. Ground Level: Parking for 9+ Cars, Steps to Covered Entry, Large Rec. Room w/Pool Table, Wet Bar w/Refrigerator, Microwave, & Dishwasher, TV/VCR, Stereo w/CD, Half Bath (Accessible from Rec. 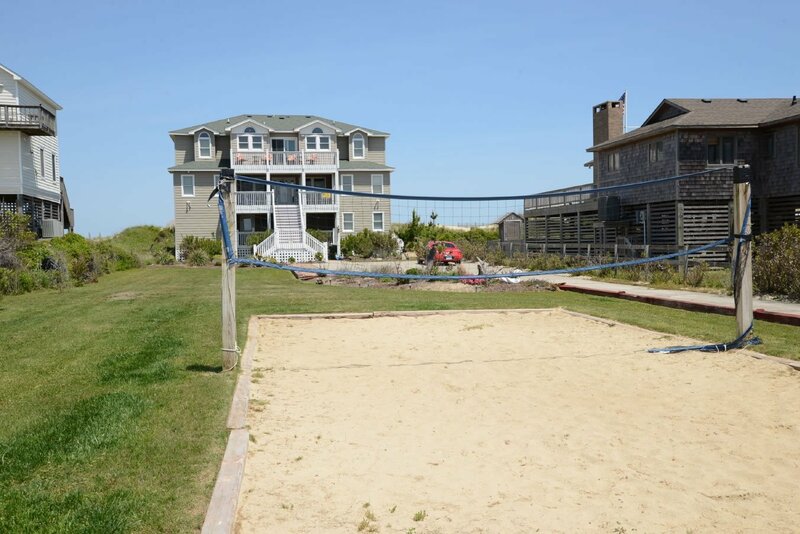 Room & Pool Area), Laundry w/2 Washer/Dryer Sets, & Another Refrigerator, 4 Bedrooms (1 w/Queen & TV, 1 w/Duo Bunk w/Trundle & TV, 1 w/Queen & TV, 1 w/2 Bunk Sets & TV), 2 Shared Baths, Access to Beautifully Landscaped Yard w/Volleyball Court, Private Swimming Pool (Can Be Heated for $450 Per Week, Plus Tax in 2019), Enclosed Outside Shower, Fish Cleaning Station, Charcoal Grill, & Walkway to Beach w/Dune Top Deck. 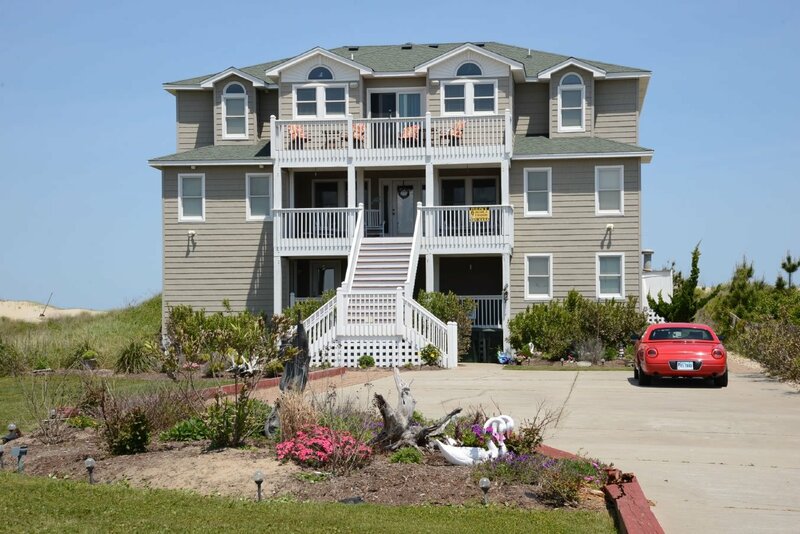 Mid Level: Lovely Tiled Foyer Entry Area w/Seating, Covered Deck w/Rockers, Ocean Views, 6 Bedrooms (3 Master Suites w/Queens, TVs, & Full Baths, 1 w/Queen & TV, & 2 w/2 Singles & TVs, & Shared Full Bath) Full Hall Bath, & Oceanfront Covered Deck w/Hot Tub. Top Level: Grand Living Area, TV, VCR, Stereo w/CD, Gas Fireplace, Wet Bar w/Mini-Refrigerator, Wine Cooler, Half Bath, Kitchen/Dining Area, w/2 Refrigerators, 2 Range Ovens, 2 Dishwashers, Microwave, Ample Seating, 2 Bedrooms (2 Master Suites w/Kings, CATVs, & Full Baths w/Jacuzzi's), & Oceanfront Sun Deck w/Deck Furniture & Outstanding Ocean Views. 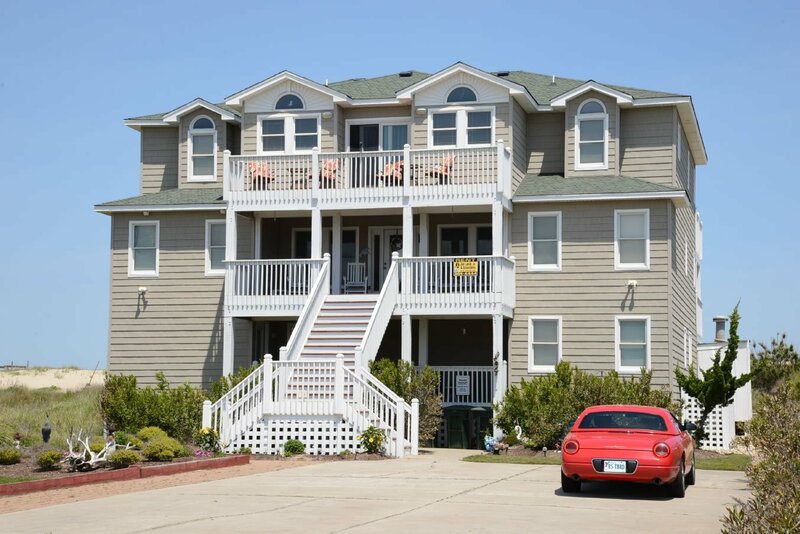 Features include: C/AC & Heat, 2 Washer/Dryer's, 3 Dishwasher's, 2 Microwave's, 2 Stove's, 4 Refrigerators, Phone, 14 TVs, 14 VCRs, DVDs, 3 Stereo's w/CD, Wireless Internet, Video Library, Deck & Pool Furniture, & Picnic Table. No Pets. This is a Non-Smoking Unit. 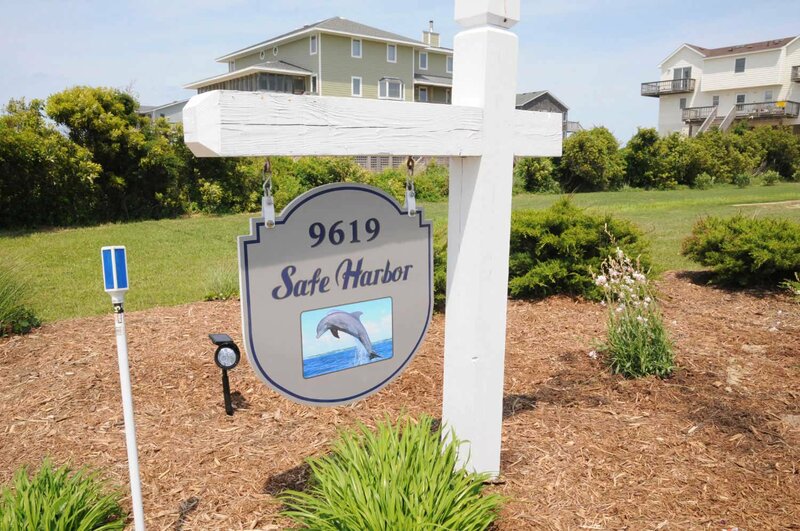 We love Safe Harbor. It is perfect for our family, and we will be returning for our 3rd year on '19. The house is very spacious and was perfect for our family. Your home is beautiful and we had a wonderful week! Thank you for sharing it with us. Home is nicely decorated. Love the washers/dryers. This home was exactly as the website described. Well stocked kitchen. All rooms were clean, plenty of room for everyone. This was a one time family vacation and we all enjoyed staying in your home. I would recommend this home to others planning to stay in this area. Great home and we enjoyed our stay. Enjoyed the views and the access to the beach and the four-couch living room was terrific for our group. Fabulous house. Great location. Tons of room. Multi-generational layout. We had grandparents on top floor, parents and littlest kids on middle floor, and all the cousins on bottom floor. It was PERFECT! Great for larger family groups. Plenty for kids to do, great lay out. This house is so awesome, it's hard to put into words. Great home away from home feel to it. The view is beautiful from every angle. Very clean house. Very well stocked with everything you need in the kitchen. I would recommend it to everyone. Thank you joelambjr for making our vacation one to remember. Wonderful place, lots of room for large groups we have a large family plenty of space to stretch out. Kitchen was well equipped. Plenty of seating for the TV area. Loved having 2 stoves and 2 dishwashers. This house is so nice that I am not going to go into all its plus'. 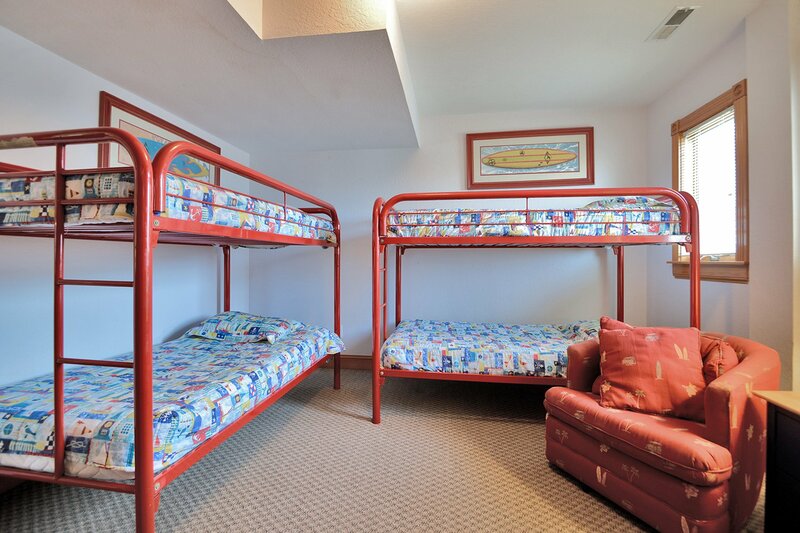 The beds and furniture are comfortable and it is very well stocked.